The time has flown. I can't believe it is exactly 6 years since I started this blog. 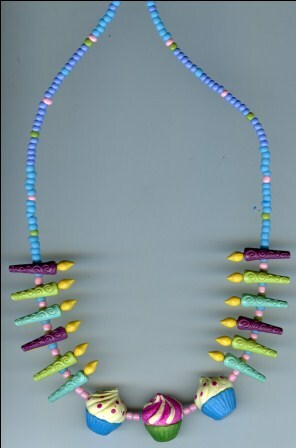 The original purpose was to showcase the wonderful work of beginner beaders who attended our workshops. Since then it has grown to be so much more - a place where I curate and write about the great tutorials and ideas shared by many generous designers, the inspirational work by innovative designers and anything jewelry related including my mini-biographical posts, now a reader favorite. But a blog won't be much fun to write if it didn't have any readers or muses. So today's the day I thank everyone for taking the time to share and read. For many of us, the internet probably is the only way to fully indulge our passion. There is only so much our non-beading families and friends can take before rolling their eyes heavenward! You don't have to go anywhere to get your latest bling fix - just a computer or mobile device and an internet service will do. We can all "travel" the world to see all sorts of innovative designs and learn more about our favorite craft. I didn't much like writing back in 2007 but over 2,500 posts later, I have discovered writing has become another creative pursuit for me. It is hard and lonely work behind the scenes but I do enjoy the challenge. With the exception of a few guest posts, virtually all the posts have been written by me. Writing is actually one of the smallest components of maintaining an active and growing blog - emails, moderating comments, editing, research, organizing giveaways, reading books, product reviews, webmaster roles, social media are just some of the other tasks which all take time. Yes, there are some rewards. But I thought the graphic below hilariously sums up the effort bloggers put in which may not be apparent to readers ! I should point out to new readers that ads and affiliate programs help support my blog so it continues to grow and remain free for all to read. Readers who purchase on Amazon and Modahaus after clicking on my links earn me a small commission. I encourage readers to leave comments either on the blog or through my social media sites. I then get to "meet" you and perhaps learn what you like about the blog. That's so I can do more of what you like! Your invaluable feedback is what guides my blogging journey. Subscribing to my blog also means never missing a post. Check out the instructions here about how to use easy feed readers if you prefer less email clutter. You will learn what those orange symbols mean and maybe impress your friends and family! I also suggest either Pinterest or Evernote to save your favorite posts here and everywhere else into categories! Enjoy these unusual Google search terms I spotted in my blog stats over the past year, some of which corresponded to actual blog posts. And yes, people still talk to Google like it was a real person! this model was photoed wearing long fabric earrings that wrapped around her neck where did she get it? cutting of ear by heavy hoop earring, bigger wire help yes or no? Piercing eyeballs (see JewelEye Piercing - Bling for Your Cornea)Not for the squeamish. Here is to another year of blogging. Will you join me? Congratulations on your anniversary! I read your blog regularly, even though I'm not really a beader or jewellery maker (those are for my next life time). Keep up the good work. I just want to say that you do a great job with your blog! It is one of my favorites and I look forward to it everyday, and find much inspiration here! Thank you! Hooray to one of my favorite corners of the web! Congrats on 6 beautiful and inspirational years, Pearl - you are one cool kitten. 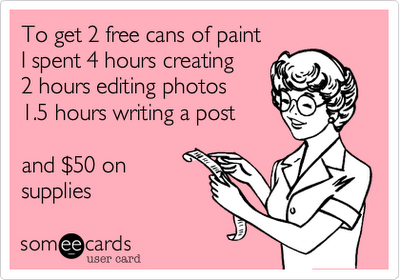 That 'free cans of paint' graphic: hilariously true. Happy anniversary Beading Gem! I enjoy reading your posts each day! Congrats Pearl! I do love receiving your posts in my inbox, but it means that sometimes I don't comment as much. Please know how much I enjoy all the great tips, links, and info I've received since I started reading your blog. Happy Anniversary!! I just wanted to say that I subscribed to you a couple of years ago and your email comes into my very busy Realtors email. I find that I always save your emails to review. It's like a treat that I give myself when I am finished. Congratulations on your anniversary of this blog and know that it really makes someones day! Happy Anniversary, Pearl. You are doing such a great job. I'm always excited to get your blog in my email. And you forgot one thing in listing all that you do in order to make this blog -- historian! I do love your historical posts, too. I don't comment as often as I should because I read the blog in my email but I'm here with you every step of the way. Best wishes for many more years of the Beading Gem's Journal! Happy anniversary. That is quite an accomplishment. You are in my RSS feed, so I never miss a post. Thanks so much everyone for taking the time to comment - it means a lot to me! Reading your blog is the highlight of my day. I truly save it for last to savor it! I recommend your site on a regular basis. As a matter of fact, struck up two conversations at Joann's the other day and gave your site name to each of the ladies. Many good wishes for strength and fortitude because there is no question what you do is quite a challenge, and you do it beautifully. Congrats Pearl! I am forever amazed at the variety you are able to provide your readers and often wonder how much time you really spend on researching, etc. Because I'm not sure I could be so dedicated. No, I KNOW I couldn't be so dedicated! Happy Blog-iversary Pearl, may there be many, many more. Once again, thank you! I must say that I am not really a historian but a writer who can make a quick biographical "sketch" based on the work of real historians! It is quite a challenge to get the essence of a person in a single blog post! I'm impressed that in 6 years, you've never run out of blog topics and are still finding interesting things to post about. So many people give up before even a year. Congratulations and thank you for the inspiration! Your blog is my encyclopedia of jewelry making!